Here at GeekTech, we’ve seen our share of lasers used for anything from art to shooting down freaking missiles. But, one that “cools”? The researchers from the Niels Bohr Institute at the University of Copenhagen have developed such a “cooling” laser that can bring a superconductor’s temperature down to -269 degrees Celsius. In the experiment, the scientists created a new semiconductor membrane using gallium arsenide. 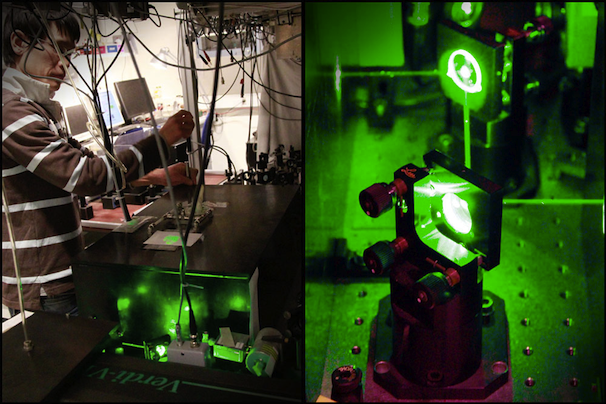 The square-millimeter membrane was placed into parallel to a mirror and hit with a laser. When the laser hits the membrane, some of the light is reflected to the mirror, that in turn gets reflects it back to the membrane in a game of pong with photons the scientists call an optical resonator. While this happens, the mirror is also moved; the changing distance between the mirror and the membrane creates an optical fluctuation the scientists can control. This lets the scientists cool the membrane down to negative 269 degrees Celsius, while at the same time heating it. The scientists say that their discovery of this seemingly paradoxical temperature control with lasers could lead to a whole new field of research known as optomechanics, which could pave the way for cooling quantum computers.